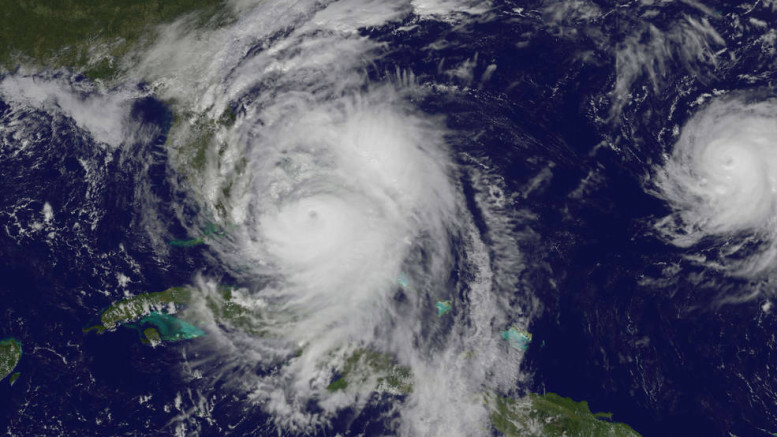 I just had to laugh when I saw that they had finally named a hurricane after my wife, Norma! Although she is usually reasonably calm, when she gets her dander up, you probably don’t want to be around! Just like Hurricane Norma. Hurricanes have been so terribly devastating this season and the stories we have watched and read about have absolutely broken our hearts. All of the areas in Texas, Louisiana, Florida, Puerto Rico, the Virgin Islands and other Caribbean islands: destruction so widespread and so intense it brings tears to our eyes. I am extremely distressed to see the upheaval that so many have experienced in their lives, but yet I think back to just a few years ago when, in about the same areas, people were confronted with losses just like this hurricane season brought and have to wonder how people can abide going through this time and again. Surely nobody believes that scientists can even control these storms. Insurance policies go only so far in helping you put your life back together. I understand why people go back. I am familiar with most of these areas and they are beautiful. The weather is normall mild and many of these places are the perfect platform for eternal vacations. But seeing the tens of thousands of people uprooted from their homes, many of whom will not have homes to return to, has made us even more thankful that we live in a country that is virtually untouched by these tropical storms and their devastation. Yes, Panama. No hurricanes. Ever. After living in Panama for almost 4 years, I have to tell you that we have eternal vacations without hurricanes! Panama is outside of the Hurricane Alley. 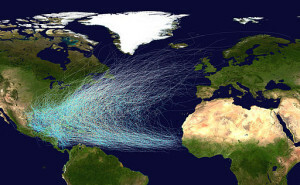 Hurricane Alley is an area of warm water in the Atlantic Ocean that stretches from the west coast of North Africa to the east coast of Central America and Gulf Coast of the Southern United States. This graph shows (in light blue) the tracks of all of the hurricanes over the past 150 years. You see that little squiggle of green just off the top left of South America? That’s Panama. No hurricane landfalls. Ever. Tracked over 150 years. Panama is free of hurricanes and tropical storms from the Atlantic side and free of tsunamis & typhoons from the Pacific side. The climate is mild, ranging from 75 – 95 degrees daytime temperatures to 55 – 75 nighttime temps, depending upon whether you are at the beach, in the city or in the mountains. No snow. Ever. Nobody really needs a furnace here. Air Conditioning is optional in many areas, believe it or not. Where we live, the constant breeze from the ocean preempts the need to use air conditioning. The point I am trying to make is that, instead of the risk of losing your residence, vacation home or real estate investment every few years, consider making this kind of investment only once here in Panama. And if you decide to get rid of your investment here, just sell it. You don’t even have to think about how much your insurance company will reimburse you if it destroyed by hurricanes or tornadoes! 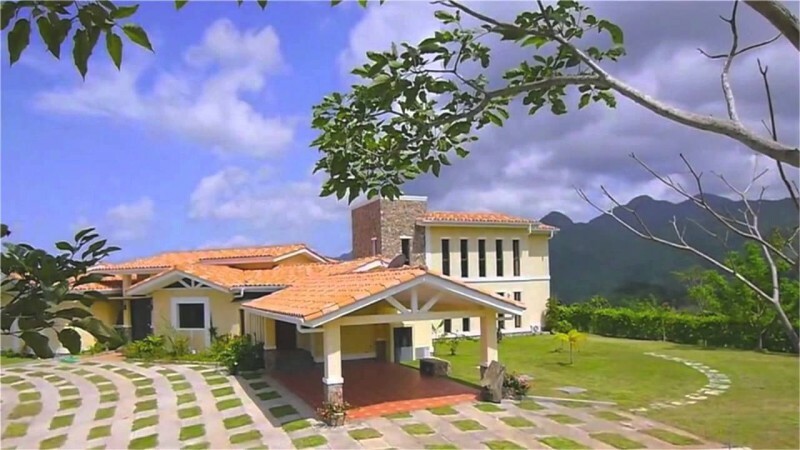 The bonus for making your investment in Panama is not only the gorgeous weather, it is also the beauty of the country, the much, much lower prices than in the United States and NO Property Taxes for 5, 10 and 20 years for most properties. Trinity Hills Valley is a gated mountain residential community only 30 minutes from beaches and less than 40 miles from Panama City which offers its owners quality construction in a breathtaking setting at a fraction of the cost of other similar residential projects. Even though you have the sense of being far out in the countryside, shopping and hospitals are easily accessible within just 30 minutes. The mountain temperatures are mild, averaging daytime temperatures of 77 degrees and 68 degrees at night–perfect for cookouts, evening wine tasting and stargazing. Entry at just $36 – 40,000 with financing available for the remaining 80%. For more details, call me at 303-351-3006 or email me at fpb@AnAmericanInPanama.org. 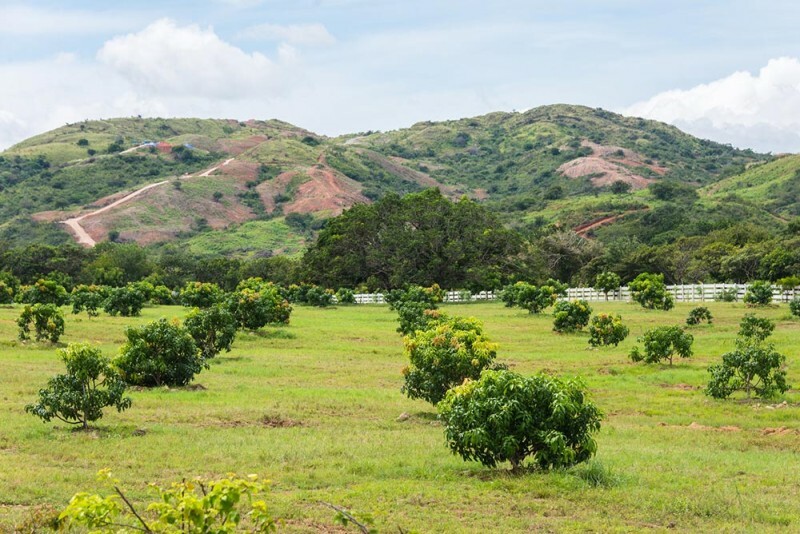 If you love the safety of Panama but aren’t ready to live here, maybe you would like to secure and diversify some of your retirement savings by purchasing a hectare (2 1/2 acres) of the Mango Farm. 2017 has been an extremely busy year at the Mango Farm. In addition to all of the ongoing seasonal work, a new packing facility has been added and another nursery has been built increasing the area by another 4.5 hectares. This unique certified organic farm has generated huge interest. Just recently, the farm was visited by Panama President Juan Varela, in recognition of its tremendous contribution to permaculture in Panama and on the world scene. The organic fruits produced here also enjoyed exposure at the trade mission in Washington D.C. this year and have already reached supermarket shelves. Bear in mind that the first trees were planted only 3 years ago! I am pleased and yet amazed that you still have the opportunity to become an owner of a hectare of this organic mango farm at a price of less than $40,000! Production and income is well ahead of projections already. Currently 600 hectares in production. Available, but the door is closing. Still projecting 25% return on investment in year 5. $10,000+ annual income on an investment of less than $40,000. Production for 50 years plus. Call me or email me today to get full details. Most people in the civilized world recognize that organically produced fruits and vegetables are much better for you that those that are inundated with chemical fertilizers, insecticides and growth enhancers. Panama is so on board with organic production! Recently, Frank & I made a trip high up in the mountains of Chiriqui in Panama to a small town called Cerro Punta. 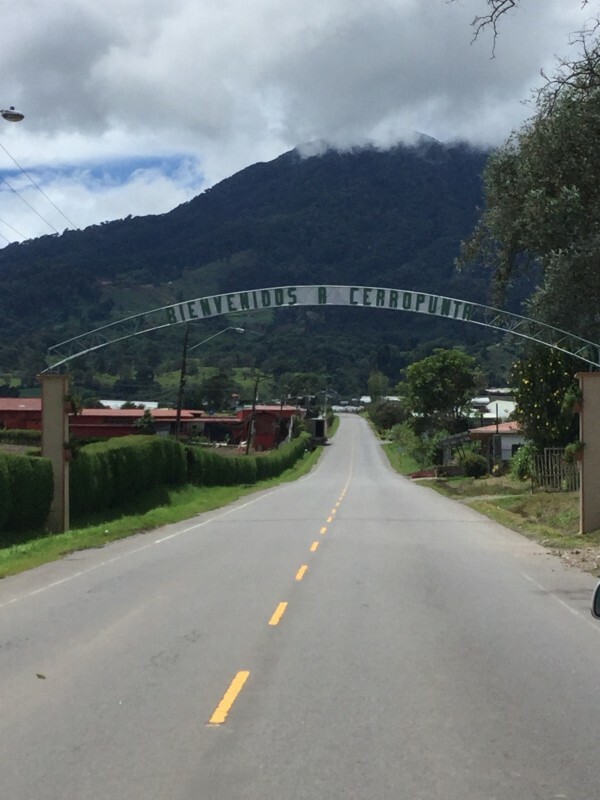 When you first drive into Cerro Punta, you are struck by the fact that there are productive fields of vegetables all over the mountainsides as high up as the eye can see. Fantastically green, this place produces 80% of the vegetables for consumption in Panama! Many of these farmers & companies produce naturally grown fruits and vegetables, even they are not certified organic. We bought a huge bag of red & green cabbage, carrots, beets, leeks, potatoes, celery, onions–tons of stuff! – and paid only $7. We have eaten on this produce for weeks! So many wonderful gems here in Panama! In closing, consider Panama in your future, whether to invest for amazing income or to visit for vacation or to live. Contact us with your questions. We love to hear from you! Be the first to comment on "Norma on the Rampage?"